I’m reposting this article in full (written by Tom Barnes on mic.com – see the original article here). It’s full of gems about why everyone should learn to play music! Read Tom Barnes’ wonderful article about how your parents decision to have you learn music produced some incredible effects on your mind. If your parents ever submitted you to regular music lessons as a kid, you probably got in a fight with them once or twice about it. Maybe you didn’t want to go; maybe you didn’t like practicing. But we have some bad news: They were right. It turns out that all those endless major scale exercises and repetitions of “Chopsticks” had some incredible effects on our minds.Psychological studies continue to uncover more and more benefits that music lessons provide to developing minds. One incredibly comprehensive longitudinal study, produced by the German Socio-Economic Panel in 2013, stated the power of music lessons as plain as could be: “Music improves cognitive and non-cognitive skills more than twice as much as sports, theater or dance.” The study found that kids who take music lessons “have better cognitive skills and school grades and are more conscientious, open and ambitious.” And that’s just the beginning.The following list is a sampling of the vast amount of neurological benefits that music lessons can provide. Considering this vast diversity, it’s baffling that there are still kids in this country who are not receiving high-quality music education in their schools. Every kid should have this same shot at success. Music is deeply mathematical in nature. Mathematical relationships determine intervals in scales, the arrangement of keys and the subdivisions of rhythm. It makes sense then that children who receive high-quality music training also tend to score higher in math. This is because of the improved abstract spatial-temporal skills young musicians gain. According to a feature written for PBS Education, these skills are vital for solving the multistep problems thatoccur in “architecture, engineering, math, art, gaming and especially working with computers.” With these gains, and those in verbal and reading abilities, young musicians can pretty much help themselves succeed in any field they decide to pursue. In a 2007 study, Christopher Johnson, a professor of music education and music therapy at the University of Kansas, found that “elementary schools with superior music education programs scored around 22% higher in English and 20% higher in math scores on standardized tests compared to schools with low-quality music programs.” A 2013 study out of Canada found the same. Every year that scores were measured, the mean grades of the students who chose music were higher than those who chose other extracurriculars. While neither of these studies can necessarily prove causality, both do point out a strong correlative connection. Surprisingly, though music is primarily an emotional art form, music training actually provides bigger gains in academic IQ than emotional IQ. Numerous studies have found that musicians generally boast higher IQs than non-musicians. And while these lessons don’t necessarily guarantee you’ll be smarter than the schlub who didn’t learn music, they definitely made you smarter than you would have been without them. Children who start studying music early in life develop stronger linguistic abilities. They develop more complex vocabularies, a more nuanced understanding ofgrammar and higher verbal IQs. These benefits don’t just impact children’s learning of their first language, but also their ability to learn every language they attempt to learn in the future. The Guardian reports: “Music training plays a key role in the development of a foreign language in its grammar, colloquialisms and vocabulary.” These heightened language acquisition abilities will follow students their whole lives and will aid them when they need to pick up new tongues late in adulthood. Playing music puts a high level of demand on one’s working memory (or short-term memory). And it seems the more one practices their instrument, the stronger their working memory becomes. A 2013 study found that musical practice has a positive association with participants’ working memory capacity, their processing speed and their reasoning abilities. Writing for Psychology Today, William R. Klemm claims that musicians’ memory abilities should spread into all non-musical verbal realms, helping them remember more content from speeches, lectures or soundtracks. 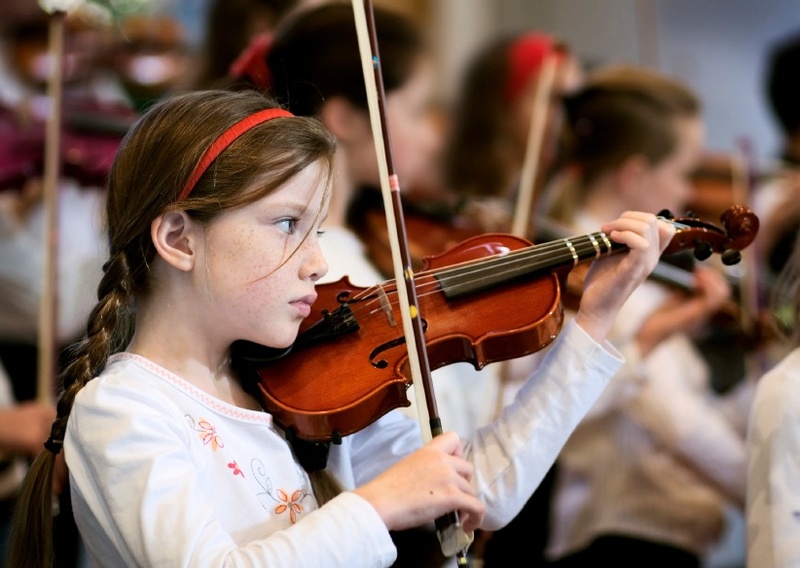 Several studies have shown how music can enhance children’s self-confidence and self-esteem. A 2004 study split a sample of 117 fourth graders from a Montreal public school. One group received weekly piano instruction for three years while the control received no formal instructions. Those who played weekly scored significantly higheron self-esteem tests than those who did not. As most of us know, high levels of self-esteem can help childrengrow and develop in a vast number of academic and non-academic realms. Creativity is notoriously difficult to measure scientifically. All measures generally leave something to be desired. But most sources hold that music trainingenhances creativity “particularly when the musical activity itself is creative (for instance, improvisation).” According to Education Week, Ana Pinho, a neuroscientist at the Karolinska Institute in Stockholm, found that musicians with “longer experience in improvising music had better and more targeted activity in the regions of the brain associated with creativity.” Music training also enhances communication between the right and left hemispheres of the brain. And studies show musicians perform far better on divergent thinking tests, coming up with greater numbers of novel, unexpected ways to combine new information.